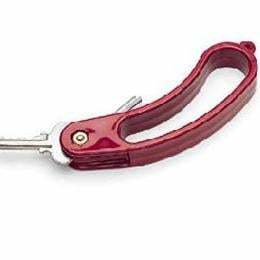 For people with limited hand mobility, this key holder provides several grasping positions and excellent leverage. Thehandle can be grasped in two ways, either with the fingers insertedthrough the hollow center or around the outside. One or two keys fitinto the slots and are held by a single screw. Holds house door keys aswell as most car keys (without plastic key head covers). The keys foldback toward the inner curved side of the holder. Has a hole for a wriststrap, key chain, key ring or for hanging on a hook.